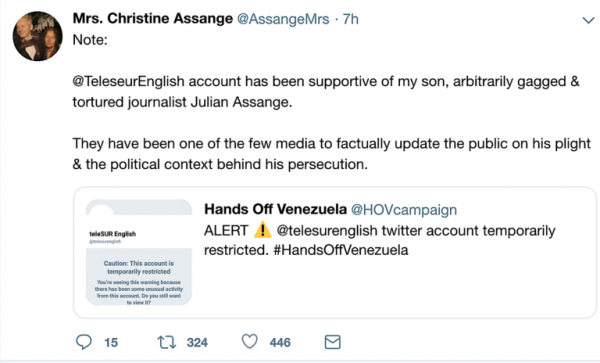 Christine Assange, the mother of WikiLeaks founder and publisher Julian Assange, had her Twitter account restored more than 24 hours after it was abruptly restricted by the social media company. Hundreds of tweets were sent to the San Francisco-based company by supporters demanding that she regain access to her account. Ms. Assange told Consortium News by phone that she has had no contact with Twitter and still does not know why her account was restricted and precisely why it was restored. She was unable to post new Tweets or read anyone else’s while the restriction was in place. Outrage at the restriction was expressed by many Assange supporters in tweets to Twitter and its CEO, Jack Dorsey.